Vakhani, vakhani is the new Makhuwa phrase I’ve been living by, it means pouco a pouco, little by little, petit a petit. It has also turned out into my pick up line on how to make friends at site (any attempt at speaking Makhuwa makes all those around me laugh (with at me). I’m going on day five at site, and as some of my friends are finishing up their final exams stateside, I feel the same fatigue that I used to feel when I was studying for mine. After a bittersweet swear-in ceremony at the Ministry of Education, all 64 of us volunteers stayed at a chiquey hotel one final night, ordering pizza poolside and drinking beers at neon lit bars in creepy, quiet corners of Maputo City, before boarding our respective planes and chapas to go to our permanent sites. Turns out, my 6:30 am flight prioritized a commandante and his friends and decided to move me, three other PCVs, ten Chinese businessmen and a few Mozambicans on to the next flight (this entire ordeal deserves its own blog post which I will write later, I promise). My friend Allison and I at the MinEd. She’ll only be 791 miles, two military convoys and one travel ban away! The famous volunteer map at the PC Maputo office. Neon lights make surprisingly well for bittersweet despedidas. 24 hours, one plane ride, a hostel stay, a supermarket stop, a final restaurant meal, and a five hour chapa ride later, I made it to the villa of Malema, just as dusk was settling in. A fifteen minute walk into the bairro behind the market and I was handed the seven keys that open up my fortified, grated up house. Inside: two bedrooms and an array of turquoise-blue and lime-green walls. Furniture-wise: na-daaa. My sitemate and I ran back to the market, found a mattress store and quickly bought one in a hurry, paying a kid to bring it back to my house. That night I slept on a plastic covered mattress, no sheets (since my luggage wasn’t arriving until two days later), covered by various articles of clothing and a halfway attached mosquito net. Only two cockroaches the size of my index finger got in, so it was a luxurious version of camping, if I can say so myself. Not your average restauration hardware showroom. My house ont he left, the infamous gazebo on the right. Day two: the rain brought down to electricity poles in the next town over and I wouldn’t know it until later, but Malema would be out of energia for 72 hours. Without electricity, I didn’t have the terabyte of movies and TV shows on my hard drive to resort to, so instead I figured it was time to meet the family that lived across the street. Mid afternoon, I pushed open their quintal door and introduced myself to two of the kids, stuttering a little bit. “Hey, uh I’m Leonora, I just moved across the street and I’m going to be a French and English teacher at the secondary school over lá, so if you guys have any questions about those subjects, just drop by.” Sure enough, two hours later, the girl that would become my first friend from the bairro, Idelsa, came over and sat in my gazebo, “I want you to teach me English.” Uh ok, of course. Again, that night we were without electricity, my electric kettle wouldn’t work, so my instant soup dinner option would be was quickly pushed aside for a pack of coconut cookies and the remainder of my 1.5 liter of water. By 6:30pm, it’s pitch black outside, no comforting sounds of bad quality speakers blaring Mozambican hip hop remixes, and no blue light flickering from TV screens across the bairro. Just me, my headlamp, my sheetless mattress and my phone at 31%. 6:30am the next day, I am woken up by repeated “com liscensas,” excuse-mes, of the neighborhood kids knocking on my quintal door. Excited to have friends, I open it up, dish out some Portuguese picture books and next thing I know, there are at least sixteen kids, jumping rope and fighting for the books. I’m having a conversation with one older kid, Faizo, who tells me he’s a seventh grader, taking his truck to America next week to sell wood, when Idelsa comes into my quintal and says out loud, “Tia Leonora, don’t talk to him, he’s the neighborhood ladrão (robber), he’s been to jail two times already.” He acts all awkward and tells me not to believe her, while Idelsa and the rest of the group go on to tell me that he’s been kicked out of his dad’s house for stealing from him. Well, well, well. Emotions are about to get the best of me, so I tell everyone to go home as I have to prepare lunch. I shut my quintal door, lock it, and break down crying. Idelsa, from her house, can see into mine, went to get two neighborhood Mães to come in and console me, telling me not to cry, that I have to be a strong woman, and I can’t tell people that I’m living alone. So here I am, a 22 year old senhora professora in tears in front of my new neighbors who are barely older than me, running their own households with at least four kids, consoling the new white girl, there being a huge possibility that I am the only white girl they’ve ever talked too. Welp, at least I’m making a name for myself. Just as I’m calming down, I hear the beep beep of the Peace Corps car, and see the Peace Corps country director and the Peace Corps director of the north walk into my quintal, carrying my heavy luggage, a little appalled and confused by what is going on. I’m still in tears, now more embarrassed than ever, hoping they will count this as “integrating into the community.” The Mães and Idelsa are all trying to explain to them why I’m crying in a combination of Portuguese and Makhuwa, while I’m trying to introduce my newfound friends to my chefes, which leads to one of them going off with the ladrão’s sister to give a stern talking-to to Faizo’s own mom, who promises her son is a good kid. My landlord joins this party, only to explain to me and my concerned country director that I don’t need to let everyone in my quintal and that the only time he was every robbed was when his brother took his corn without asking…. so I should be safe as long as I don’t leave corn or buckets lying around my quintal. My gazebo is now known as “a escola” where kids fight over alphabet cards and the four Portuguese paper back books I have. They are usually com licensa-ing on my quintal door the second I open my front door (it’s almost like they have a sixth sense) but without them my house would feel so so lonely. I finally found an empregada, who is going to sweep my quintal, wash my clothes and bring me water three times a week (which solves the first problem of me still not knowing where the water tap is… and the second embarrassing problem of still not having the force to carry a ten liter bucket on water- whether it be on my head or in my arms). 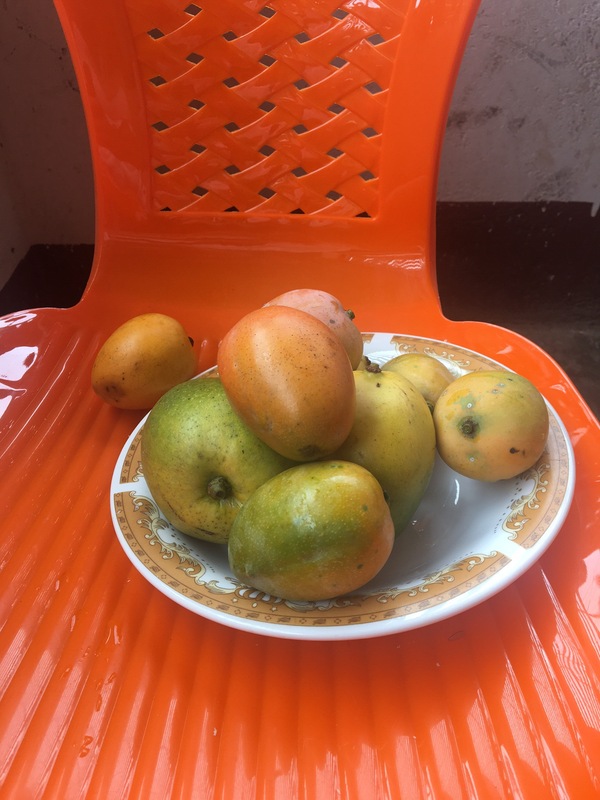 And most importantly, my house has a mango tree and my landlord’s little brother climbs it every morning to pick the ripe ones and give me them. So life is going vakhani, vakhani, and (even though I’m counting down the days until Christmas, where I can see my friends, drink some wine and speak some English), I’m starting to really like it. ← Mãe, I made it!